The Company Profit Extraction calculator provides an indication of the Net Spendable Income for the client (and employed spouse), and to show how the profits are distributed. 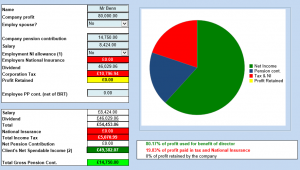 Based on an input of the amount of company profit available, this calculator allows input as to how that profit can be used for either salary, dividends, pension contributions, or to be retained within the company. 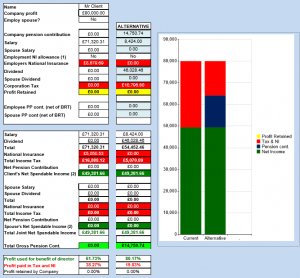 It will calculate total net spendable income and a pie chart of how the profits are distributed. There is also an additional ‘Alternative’ sheet. This enables you to input an alternative profit extraction strategy, which will demonstrate the benefits of Pre & Post planning that could be considered by the client. registered office address at Whiteacres, Cambridge Road, Whetstone, Leicestershire. LE8 6ZG.